The wombat's broad massive head seems almost too large for the stumpy body, but it is marvellously adapted for its purposes. The bones of the skull are extremely strong and unlikely to be damaged when the head is used, as it often is, as a battering ram to move comparatively large and heavy objects. A stubborn rock or stone encountered while digging a burrow, a newly fallen tree branch or a small sapling encroaching on a favourite pathway, a tautly strung wire fence - the wombat simply pushes at them with its broad strong head, and with its not inconsiderable weight and stubborn nature, it usually succeeds in moving the object aside or lifting it out of the way. The top of the wombat's skull is also broad, and the bones that, fused together, form the cranium or brain case are particularly strong and rigid. The skulls of the two genera of wombats have significant differences, which makes them easy to tell apart. For example, the zygomatic process (the projection on the cheek-bone) is much larger in the hairy-nosed wombat (Figure 2.1). 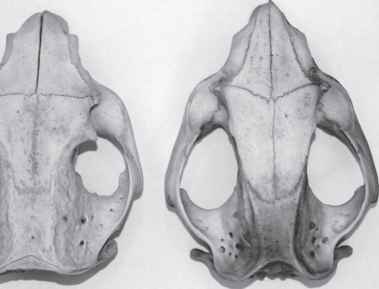 Figure 2.1 Skulls of the southern hairy-nosed wombat (left) and bare-nosed wombat (right). The zygomatic process (the projection over the eye socket) is much sharper and the nasal bones are much wider in the hairy-nosed wombat. The wombat's rather heavy face is adorned by a luxuriant set of long sensitive whiskers growing on the muzzle, and by four other smaller sets: one above the eyes, one on the cheeks, one under the chin and one near the throat (Figure 2.2). The dark brown eyes are small and set towards the side of the head, a useful feature when the wombat is digging; it also makes them less susceptible to injury when the animal is passing through the undergrowth. The eyelids are fleshy, with only a few short eyelashes. 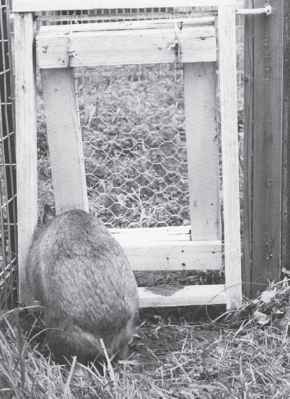 The eyesight itself appears to be poor; as the wombat spends the greater part of its life in the dark, either underground or abroad at night, other senses are more important than good eyesight. The erect ears are small, well-furred with rounded tips in the bare-nosed wombat but narrower, sparsely furred with pointed tips in the hairy-nosed wombats. The ears are set sideways on the head and they collect sounds very efficiently but can be rotated only slightly towards the back and the front as an aid in sound location. A wombat cannot flick its ears through 180 degrees as a kangaroo can, but has to turn its whole head from side to side to pinpoint the direction of a sound. 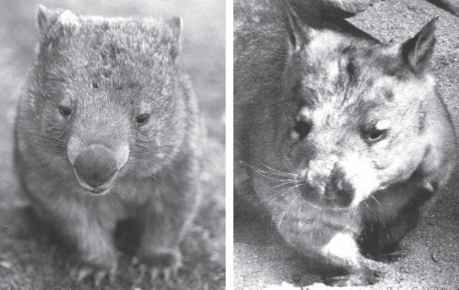 Figure 2.2 The bare-nosed wombat (left) and southern hairy-nosed wombat (right). The wombat's large nose is the most prominent facial feature. The nose of the bare-nosed wombat has a covering of thick, bare skin, which is normally 'dry', in contrast to that of a dog, where a dry nose indicates ill-health. This is in contrast to its hairy-nosed relatives, who have soft muzzles with a covering of silky white fur between the nostrils. The openings of the nostrils are extremely large, as are the nasal passages. The olfactory system is very sensitive, and the wombat probably relies even more on its excellent sense of smell than on its sense of hearing. Both the upper and lower lips are fleshy and mobile, the upper lip particularly so, and the cleft in its centre gives an even greater mobility, which is very useful when the animal is selecting grass stems. In common with all the other members of its order, the Diprotodonta, the wombat has only two lower incisor teeth, but it is the only marsupial to have only two incisors in the upper jaw also. There is a large gap, called the diastema, between the incisors and the rest of the teeth, which consist of one premolar and four molars on each side of each jaw (Figure 2.3). The wombat's teeth are unique in that both the incisors and the molars are rootless and continue to grow throughout the animal's life. Rodents -rats, mice and so on - also have continuously growing incisors, but their molars have permanent roots. 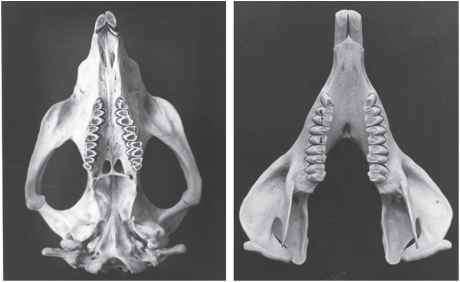 Figure 2.3 Underside of the bare-nosed wombat's skull (left). Notice the long gap, the diastema, between the incisors and the cheek teeth. The lower jaw (right) also has a long diastema. Notice the chisel-like incisors. The wombat's upper molars curve outwards and the lower molars curve inwards. When it is chewing its food the lower jaw moves sideways and upwards so that the blades of the two sets of molars meet, cutting the grass stems.